Griswold Controls’ PIC-V®, MVP®, Pinnacle and PIM valves are Pressure Independent Control Valves. 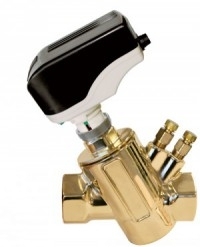 Pressure independent (PI) valves can help reduce energy costs and increase occupant comfort. PI control valves are designed to replace the conventional 2 way control valve and balancing valve pair, installed at heating and cooling coils in buildings. To obtain the most efficient and optimal results in a system, only the necessary amount, no more and no less, of chilled or heated water must be delivered to the heating and cooling coils at all times. Traditional control valves allow for over flow and under flow to coils which means excess water is pumped to compensate for their inaccuracy. The actuators in traditional valves also have to cycle more often to compensate for pressure changes in the system that impact the flow. By precisely controlling the flow of water to each coil, the valve enables energy savings, increases available plant capacity, minimizes capital expenses necessary to acquire additional capacity, and simplifies system design and control. Every year billions of dollars are wasted due to the weaknesses in HVAC heating and cooling systems. If heating and cooling systems do not consistently operate at their designed temperature differential, energy waste occurs and money is wasted. This unnecessary expense can be eliminated by using Griswold Controls’ pressure independent valves. 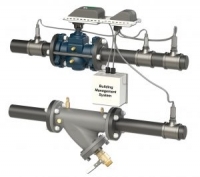 PIC-V valves offer pressure independent control with an actuated ball valve and an isolation ball valve. 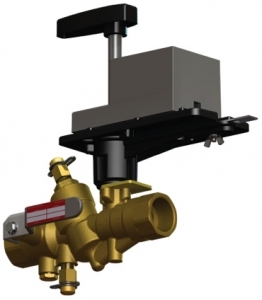 Space Saver PIC-V valves offer pressure independent control with an actuated ball valve in a compact footprint. They are available in 1/2″ to 3″ size and flows from 1 GPM to 95 GPM. The PIC-V has an optional union end. 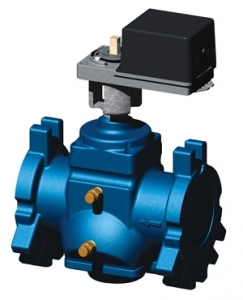 MVP Valves offer pressure independent control with an actuated valve. They are available in 2-1/2″ to 10″ size and flows from 40 GPM to 1220 GPM. Pinnacle valves offer pressure independent control with an actuated ball valve in the most compact footprint we offer. They are available in 1/2″ to 2″ size and flows from 0.163 GPM to 60.0 GPM. PIM is a modular system to control pressure differential across anything. 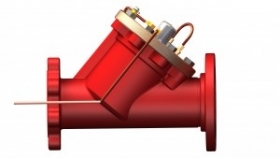 Control pressure differential across a new actuated valve (PIM-V) or an existing valve or coil (PIM-A). Available in 1/2″ to 6″ size. EPIC System measures energy usage while monitoring coil performance to adjust a Pressure Independent (PI) Control Valve to optimize coil Delta T. Available in 2-1/2″ to 10″ size.